As I discussed in a recent post, my group had a one-time “flash forward” session where they played as 25th level versions of themselves. Overall, the experience went very well; my players had fun, and I certainly did as well. 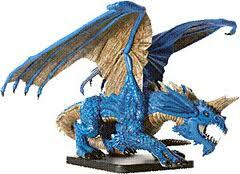 One of the highlights for me as the DM was being able to use my Gargantuan Blue Dragon figure in an encounter. The “mini” looks fantastic, and is easily my favorite among the Icons figures I have (sadly, no Colossal Red Dragon for me…yet). Knowing I wanted to use the big blue dragon in the battle, I decided to twist the players’ expectations a bit and present it as an ancient blue dragon with a red bloodline (inspired by the Draconomicon: Chromatic Dragons book). In my campaign, the PCs have been learning about Tiamat’s plan to breed together these mixed-bloodline dragons in order to create hybrid two-headed dragons as her special servants. 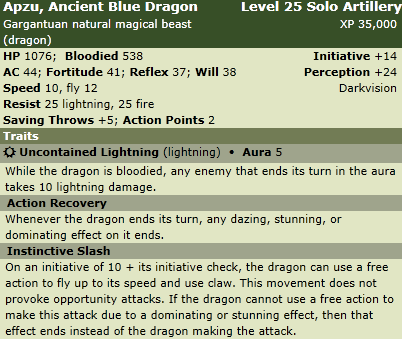 I went to the custom Monster Builder to come up with stats for the oldest of these mixed-blood dragons: Apzu (name stolen from Babylonian mythology), an enormous blue dragon, infused with the twin elemental energies of fire and lightning, a consort of Tiamat herself and one of the most powerful dragons in existence. Immediately, I ran into a problem. The ancient dragons in the Monster Builder used the old, pre-MM3 layout and stats. 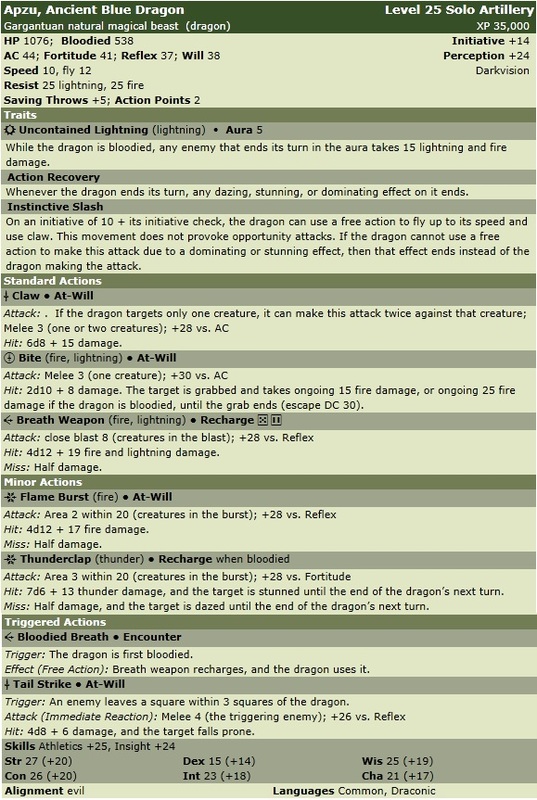 I decided that customizing the highest-level Dragons from the Monster Vault was the best plan, since these were very-well designed solo monsters, and used the new, more dangerous damage math. I was leary of using the Builder’s new customization features alone to scale the dragon up, so I also took a look at Sly Flourish’s epic-level dragon, Shademaw, which was presented in a tutorial with some excellent epic-tier advice. I used an elder blue dragon from the Monster Vault as the base, and tweaked it by adding in some red dragon characteristics. Here is what I ended up using, along with some thoughts about what worked and what didn’t. Traits were fairly easy; there wasn’t too much to do here. I kept the full lightning resistance, and added in a similar amount of fire resistance, based on Apzu’s red bloodline. Action Recovery and Instinctive Slash are both great ways to shake off the most brutal status effects, so I kept them in unchanged. Uncontained Lightning was very flavorful, but the damage was fairly low. I’d probably change it to 15 or 20 lightning and fire typed damage if I had to do it over again. Apzu’s standard actions were only slightly modified from the elder blue dragon baseline. After having used this monster in the wild, though, I would change two things. First of all, Gore was about useless. It simply doesn’t keep up with the damage output of Claw, which can be used twice each action. I believe I used Gore one time, just for variety’s sake, and while the flaming, lightning-infused horn strike made for an interesting description, it did an underwhelming amount of damage. To fix this, I would remove Gore and add in the Bite attack from the elder red dragon instead. The grab and ongoing damage effects of that attack make it significantly different from Claw, but not inferior to it. The second ability I would change is the blue dragon’s Breath Weapon. Being limited to only three targets isn’t great, and “dazed save ends” is redundant with Thunderclap (see below). 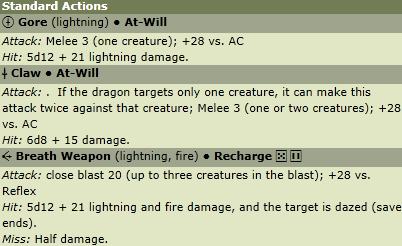 I would revamp this by using the stats from the elder red’s Breath Weapon, retyped as both fire and lightning damage. 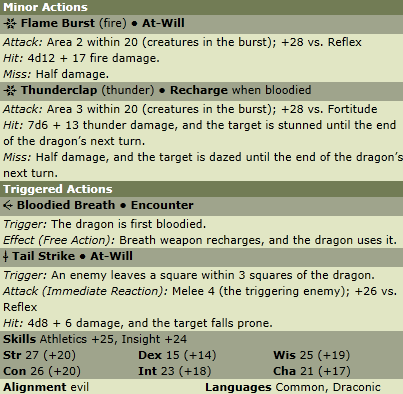 Minor and triggered actions are where Apzu received the most changes compared to the elder blue dragon template. Based on the advice given in the Shademaw tutorial, I changed the spell-like powers to be minor actions, significantly adding to Apzu’s damage potential. Flame Burst is simply a renamed and re-typed Lightning Burst. Thunderclap was good enough to be used unaltered. I stole the Tail Strike power from the elder red dragon. All three of these abilities worked fairly well, but I was a bit disappointed in Tail Strike. It quite simply never triggered. I suppose I should have moved Apzu around more, in the hopes of triggering it. Perhaps changing it to a knockback type effect, triggered the first time an enemy came within three squares, might work better. Still, these minor and triggered actions combined to make Apzu a very deadly opponent. Here is the revised stat block for Apzu, taking into account the changes listed above. I’m new at altering monsters like this, and certainly quite inexperienced with Epic tier, so let me know if you see there are any issues with it. As the name of this blog suggests, I would love to learn how to be a better DM!